Cost: Starters range from fish soups to salads and are priced from £9-19 while sharing boards of charcuterie start at £30. Mains are a selection of bistro dishes (£9-£34) and desserts (£6-12) are modern inflections of French classics. The Menu Buchon (working lunch) is good value, with 2 and 3 courses for £18 and £21 respectively. About: Bar Boulud occupies a swish street facing location on the ground floor of the Mandarin Oriental Hotel. At lunchtimes, a crowd of tourists and shoppers, business folk and families, pours through the giant front doors, making for a bustling brasserie atmosphere within. The wait staff is completely professional yet an informal mood prevails, which is all the better to eat with. You won’t find the haughty pretentious of haute cuisine here - instead the restaurant gets on with feeding people delicious and hearty food that hails from provincial France; the steaks might come with chimichurri; the burgers with green chilli mayo; and the fries arrive, thin, crisp and moreish, in paper cones that sit in metal tins. There is a sense of fun about Bar Boulud, where playful snacky additions top and tail the menu, from cheesy puffs made of gruyère-infused choux pastry at one end, to truffles textured with puffed rice at the other. And the drinking can verge on frivolity: there is a Gin menu that stands on its own and boasts not only gins flavoured with saffron, but tonics tinged with elderflower, cardamom, watermelon or lemongrass. 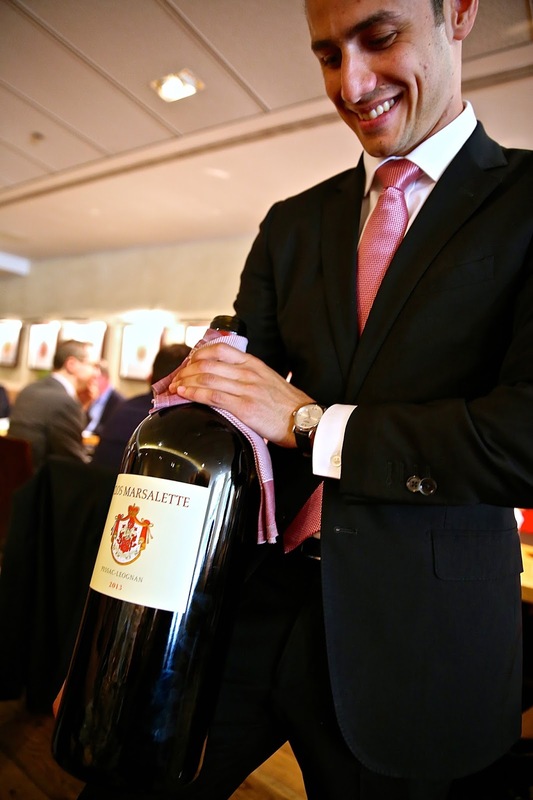 Every now and then, depending on who’s visiting, or indeed, on a whim, the sommelier might decide to open a 6 litre Imperiale of wine and treat lucky diners to extraordinary vintages from Bordeaux or the Rhone Valley at a fraction of what they’d normally cost. What We Had: We came with one goal in mind: The London Foodie’s ongoing appreciation of the top-notch burger. Yet having travelled through London on an unseasonably warm day, cross-town from meetings elsewhere, we were hungry enough to be tempted by the aforementioned gougères (£5), and a zingy starter of gravlax (£12) – delectable slices of salmon cured in gin but curiously missing the usual dill borders. I love a restaurant that takes pride in its bread, and Bar Boulud gets extra points on this count, because it serves pointy sheaves of well-textured baguette with exquisite pats of creamy butter, salted just right. If you’re not careful you could fill up on bread alone. Or even better, bread washed down with a glass of the Francois Monay house Champagne, sold at a very reasonable £12.95 a glass. The burgers, when they came, brought a whiff of Americana with them. Sitting in regal solitude on their rectangular white plates the char-grilled patties looked fit to bust out of their buns, in explosions of generous demi-rare redness, juicy and properly textured in a visibly granular way. Bar Boulud offers just three kinds of burger: The Yankee (£17), which consists of 8oz of prime British ground beef, minimally accompanied by staples from the vegetable crisper drawer – lettuce, tomato, onion and pickle. Cheese is optional. I opted to have it, but was a little disappointed that it had congealed on the way to our table and wasn’t the hot and molten sludge I’d been anticipating. The meat, however, was faultless; soft enough to adhere, but grainy enough to fall apart at the merest contact with tooth. And packed with flavour too. Other options include The Piggie (£19), topped with barbecued pork, jalapeno mayo and cabbage, and served in a cheddar bun; and the ‘BB’, priced at a royal £24. This stunning confection of patty, foie gras and short ribs stuffed into a black onion seed bun with a slick of horseradish mayo, could challenge the healthiest of appetites. My dining buddy claimed his ‘BB’ was sublime and symphonious, and neither of us left a crumb on our plates. It just so happened that the day before we visited, the sommelier had opened an Imperiale of Chateaux Clos Marsalette Bordeaux (2013). It was smooth as you like, and dreamy with warm red fruit tastes and aromas. This was available at £16 a glass, but you can also enjoy a 125ml glass of Barons de Rothschild Legende de Lafite at Bar Boulud for just £5.90. Likes: Scrumptious burgers that set a bar for others to follow, and the best bread and butter in town. The Chateaux Clos Marsalette Bordeaux wine was exceptional. Dislikes: I’d like to see a range of condiments offered with the burgers, mustards and relishes that you can add on and play with. This, it seems to me, would be in the spirit of friendly build-your-own dining that Bar Boulud cultivates so well. Verdict: Bar Boulud is a great lunch spot in the heart of Knightsbridge – writing this, I can’t think of much else I’d rather have right now than their BB Burger & frites with a glass of Chateaux Clos Marsalette, perfection! Recommended. My mouth is watering! Have been meaning to try out Bar Boulud for a while and I think your review will finally get me there. Ooh those burgers look so good, I've heard so many great things about the burgers here, I'll have to give them a try!